Warner Bros. Studio Tour London – The Making of Harry Potter in Watford will be opening its doors to teachers for one night this June to celebrate its education programme. The special event will be taking place on 7th June and the attraction is inviting 100 teachers to join the Education Team to discover more about the learning experience in the studio environment. Teachers will get to enjoy a drink in the lobby, preview a lesson and explore the attraction for themselves which includes sets, props and costumes housed at the Studio Tour. Further food and drink will then be served in the Backlot Café. Places will be allocated on a first come first served basis to qualified teachers and school trip organisers. You can register for the trip to secure a place now by clicking this link. If selected, you will be offered a pair of tickets for yourself and a colleague. UK schools are able to visit the attraction at special school rates and can enjoy a free lesson where they can discover the artistry, technology and talent that went into creating the Harry Potter film series. The education programme offers cross-curricular sessions which aim to meet learning objectives and tie in with the National Curriculum and exam board specifications. Other school perks include free teacher places, familiarisation trips, pre and post visit resources, downloadable Studio Tour trails, and a greenscreen broomstick experience. 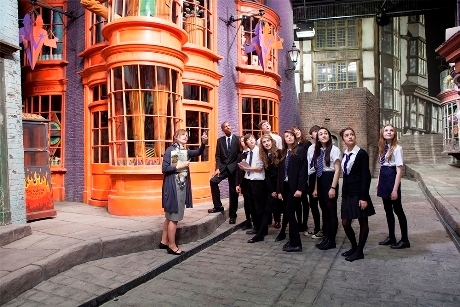 Find out more about the Education programme www.wbstudiotour.co.uk/schools.